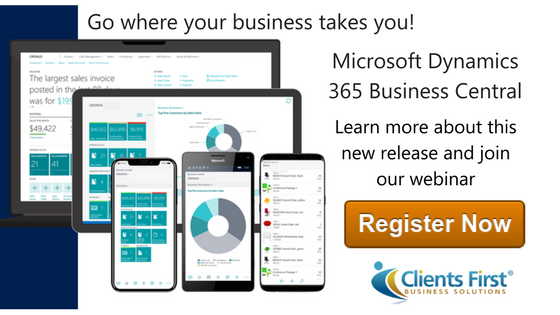 The much anticipated release of the SaaS version of Dynamics NAV now named Dynamics 365 Business Central is now available. Join us April 19 for a 45 minute webinar that will cover the current state of the ERP marketplace, where Business Central fits in the Microsoft Dynamics 365 and Dynamics NAV product line, ERP customizations (extensions), and new functions and features in Business Central. 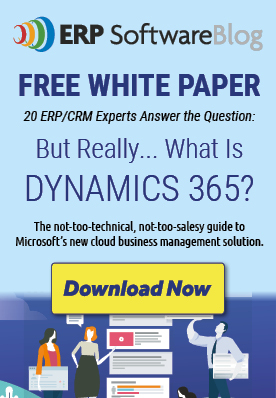 Why evaluate Dynamics 365 for Business Central? We are very excited by this release since we have a large NAV customer base and we are also a CSP or Cloud Service Provider. This means that Clients First can sell and help implement Dynamics 365 Business Central or Dynamics 365 for Finance and Operations (Enterprise Edition). Both solutions are great for finance, distribution, services, and manufacturing. Dynamics 365 Enterprise (formerly Dynamics AX) is for companies that have a larger employee count, and typically more than one complex line of business. The Software as a Service (SaaS) version of Dynamics 365 Business Central is available immediately, the on-premises/hosted version will be released in the Fall of 2018. Developers will be pleased to see this excerpt from the Dynamics 365 Spring Release Notes document: “Modern developer experience. By using Visual Studio Code, you can build powerful extensions in a modern file-based development environment and language. All-new language capabilities are included for easy integration with Microsoft Azure services such as Azure Functions. In addition to the great functionality, the Microsoft Cloud will provide reliability, security, redundancy, compliance and more, to the Dynamics 365 Business Central customer. The Microsoft Cloud allows business owners to focus on what they do best, rather than worrying about servers and licensing. This solution is also priced by license, not by server usage so billing is easy. Customers that don't want the cloud can purchase the software and host or install on-site. Microsoft's deployment options make it easy to choose a Dynamics 365 ERP.